If ever there was hell which had pink beds of cloud, mother of pearl sunrises, a shocking blue green lake, coffee plantations and stunning electric blue dance of fire, then it was definitely called Ijen Plateau. 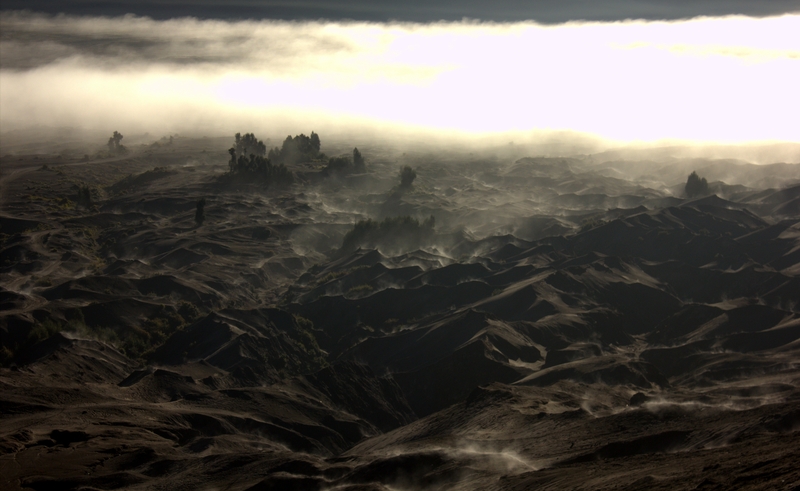 Bromo had been as surreal as a Martian landscape and Ijen turned out to be as wild as a madman’s imagination. 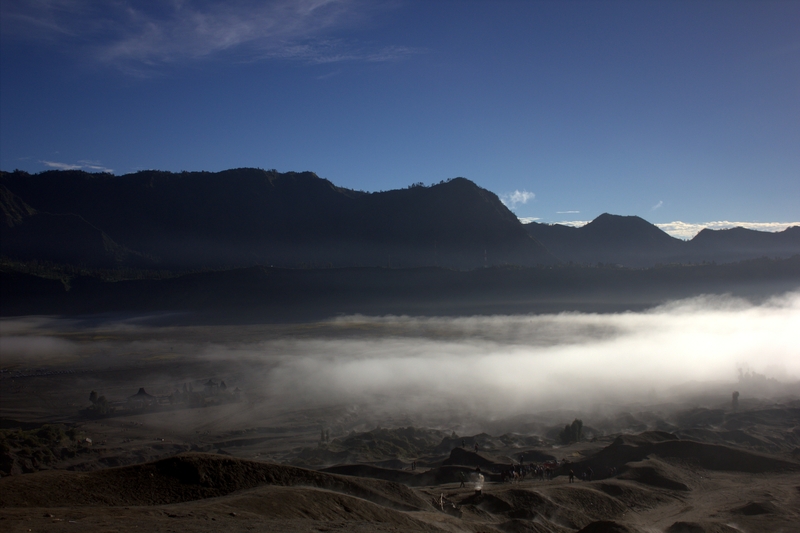 The journey from Cemoro Lawang to Ijen had been tediously long, with bad roads and terrible driving. The access to the plateau is so poor and the public transportation, accommodation facilities etc so terrible that most travelers choose to give it amiss. However as the age old saying goes, that beauty comes at a price, Ijen Plateau had, without a doubt, been worth all the pains and groans. Home of the labour intensive much controversial sulphur mining operations and the fabled “Blue Fire”, Ijen Plateau is undoubtedly the most beautiful hell imaginable. 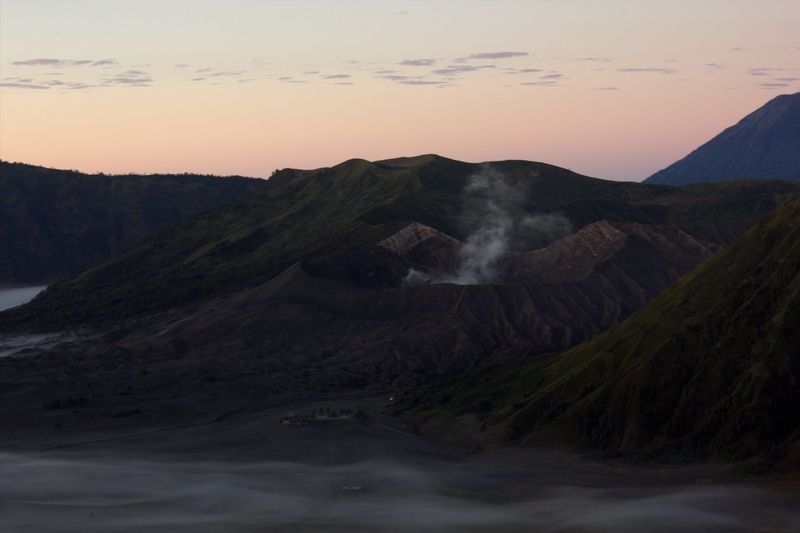 A vast volcanic region, dominated by 3 active cones of Merapi, Ijen and Raung, Ijen Plateau (or Kawah Ijen as it is also famous as) is one of the most isolated places in Indonesia. While photos of its mesmerizing, yet deadly blue sulphur lake had hypnotized us, the reality of the drive had made us irritable and bone weary. We had been on the cramped uncomfortable minivan for nearly 3 days and the adversities of traveling to isolated places in Java had started taking a toll on us. 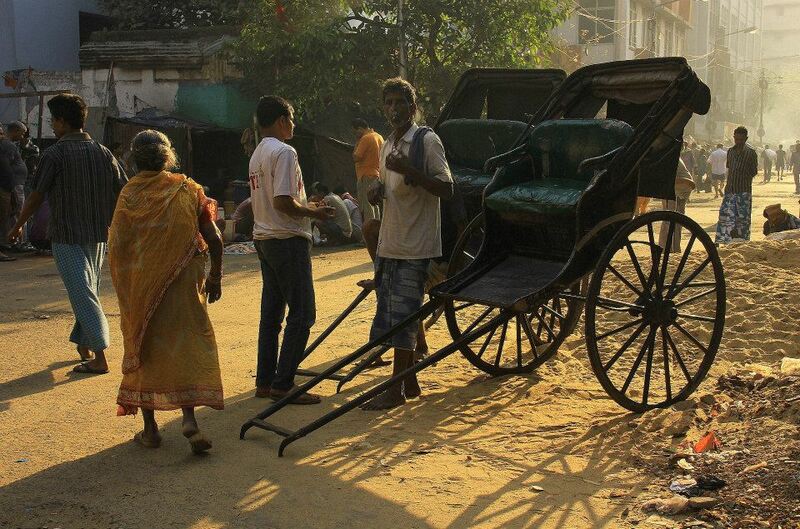 Scams had riddled our wallets and we had been edgy around most locals who had approached us with a smile. It had been pretty sad because getting scammed at nearly every step (think food, water, entrance fees etc) coupled with aggressive behaviour of some scamsters had made us react rudely to every local, some of whom had genuinely only wanted to say hello. 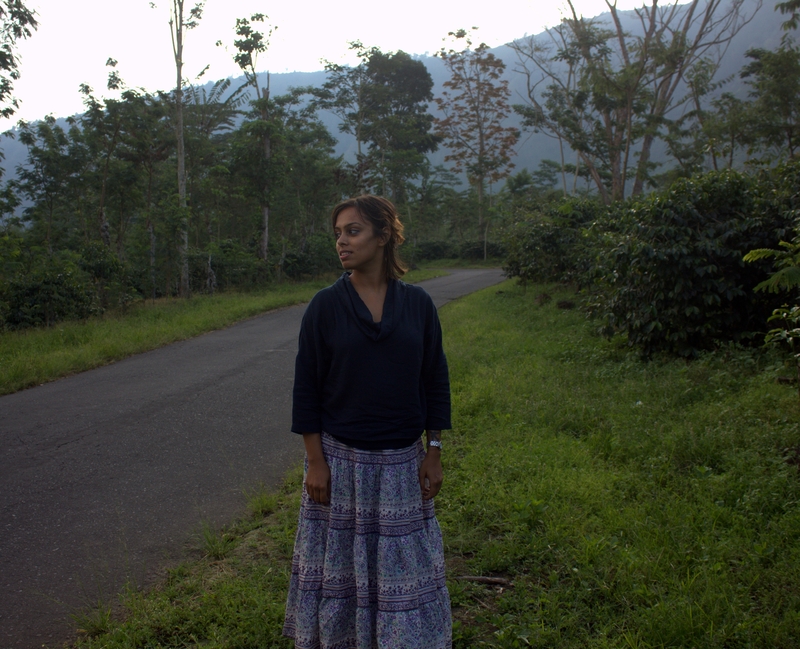 Ijen’s isolation and wilderness had made matters worse and I remember cursing my decision, when our minivan broke down for the umpteenth time in the middle of dense sugar cane fields. We had hated those moments when the drive obviously got stretched into more bone jolting hours and respite had seemed like an eternity away. 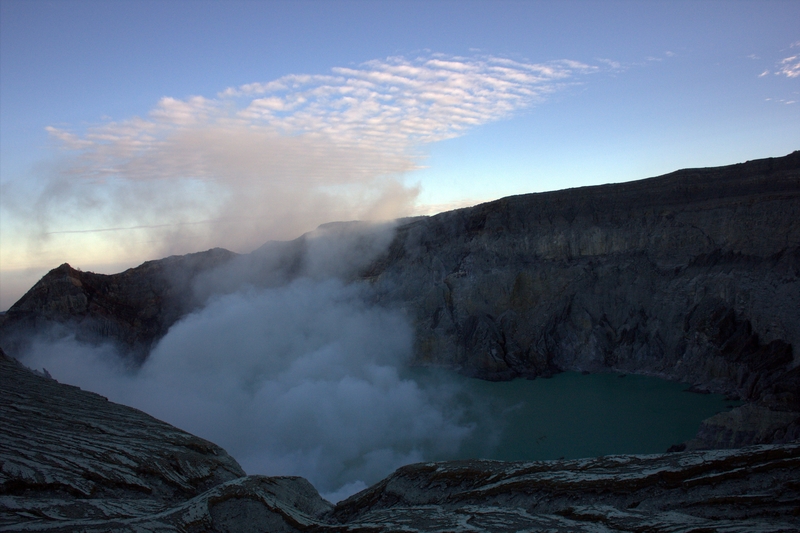 However Ijen Plateau was known for its difficult accessibility and perhaps that had protected its incredible wild beauty from getting commercialized. We had soldiered on for hours somewhere in the middle of east Java wilderness and given up hope of reaching our base in 1 piece. The last stretch of the journey especially had been very difficult and we had demanded our minivan driver to stop after every half an hour to stretch our aching backs and legs. 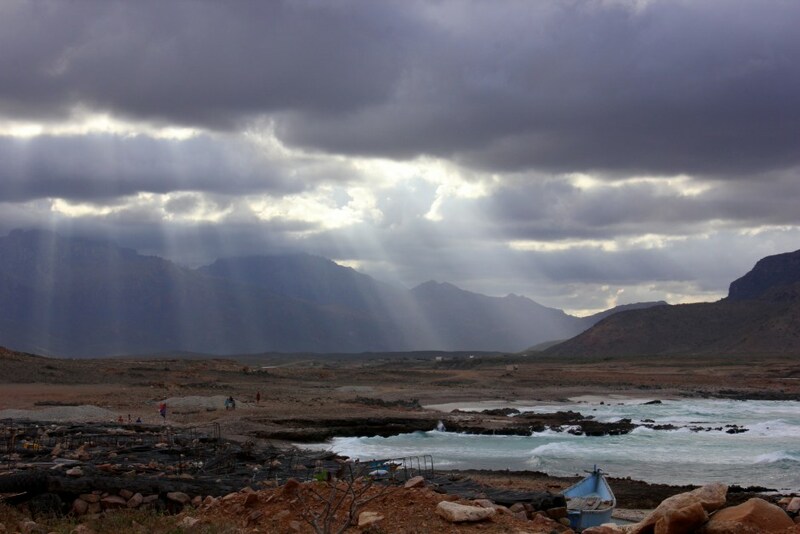 It had also been wildly beautiful outside and the isolation had made us want to go out and explore. Beautiful varied ecosystems had tumbled into one another and the whole region seemed to have its own unique micro climates. Tropical vegetation tangled in a dark, brooding manner and gave way to casuarina groves, coffee beds, strawberry farms and cloud forests. 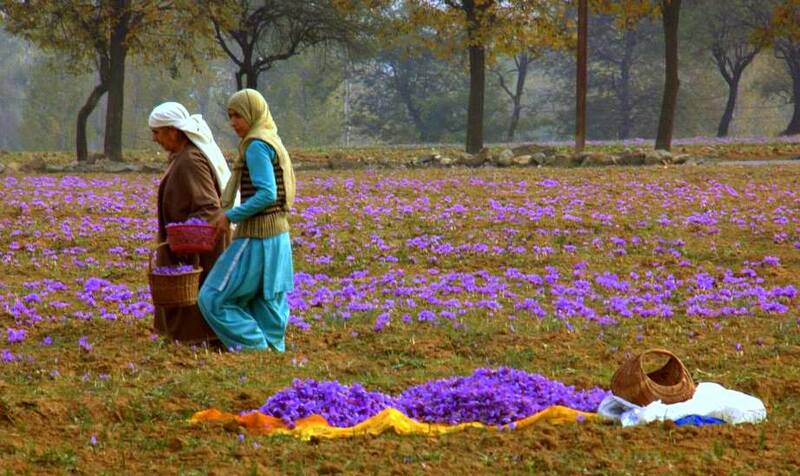 Cold misty air had enveloped us in a soft embrace and it had smelled of wild flowers, sap and unknown fruits. It had been late evening when we had finally reached the secluded village of Jampit (our jumping off base for Ijen hike) and darkness had fallen like a shroud. We had not been able to see anything beyond our little pool of blazing lights and noises of thousands of night creatures had given away its complete isolation. 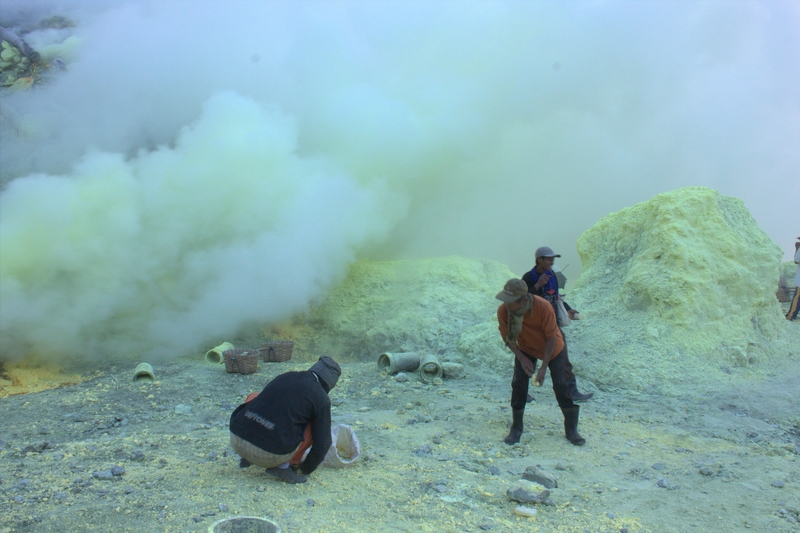 The next morning however had turned to be the biggest eye opener and coming face to face with the shocking reality of Ijen’s sulphur miners working conditions had me completely disoriented. 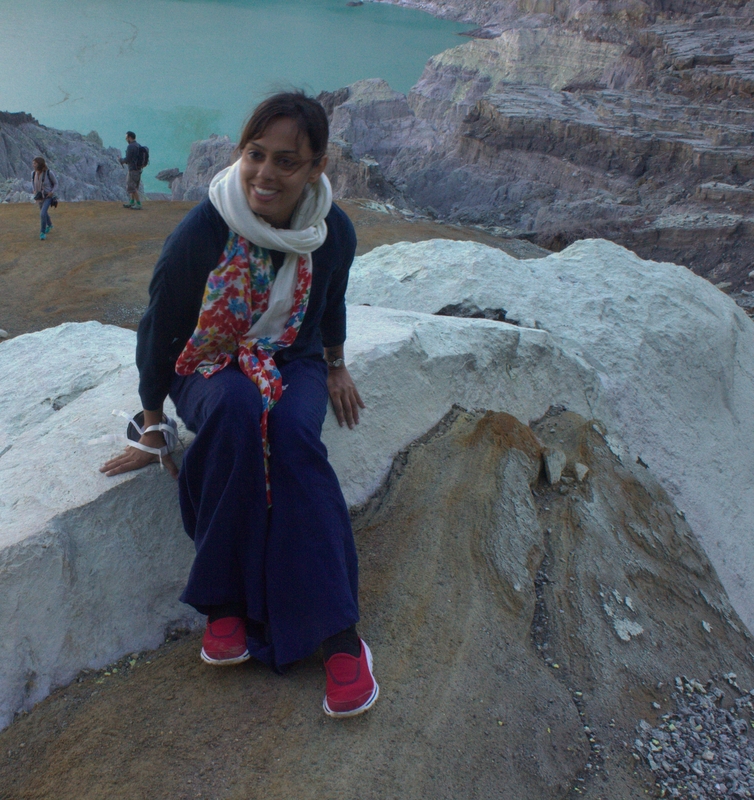 For the 1st time, I had felt ashamed of complaining about the hotel bed, food etc and realized that while I had the luxury to forego the materialistic difficulties faced at Ijen by canceling the trip, there were people for whom that was the only option available. 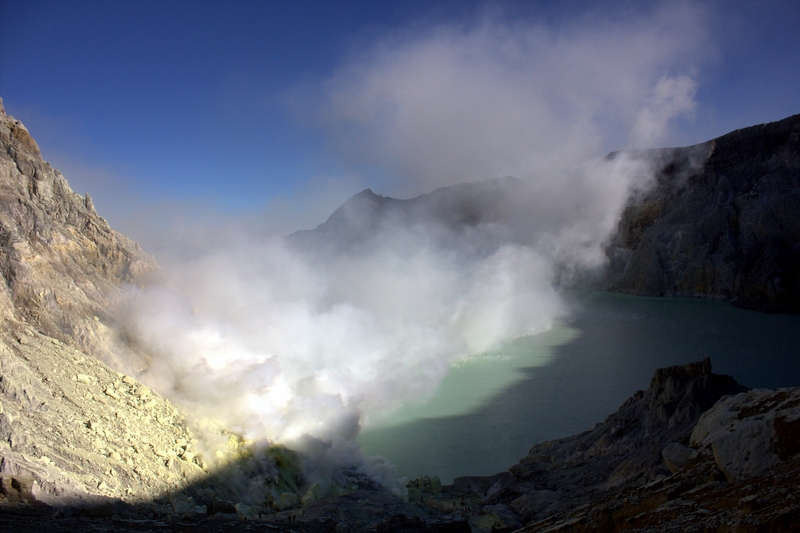 The historically active Ijen volcano contains a nearly 1 kilometer long acid lake which produces pure sulphur. 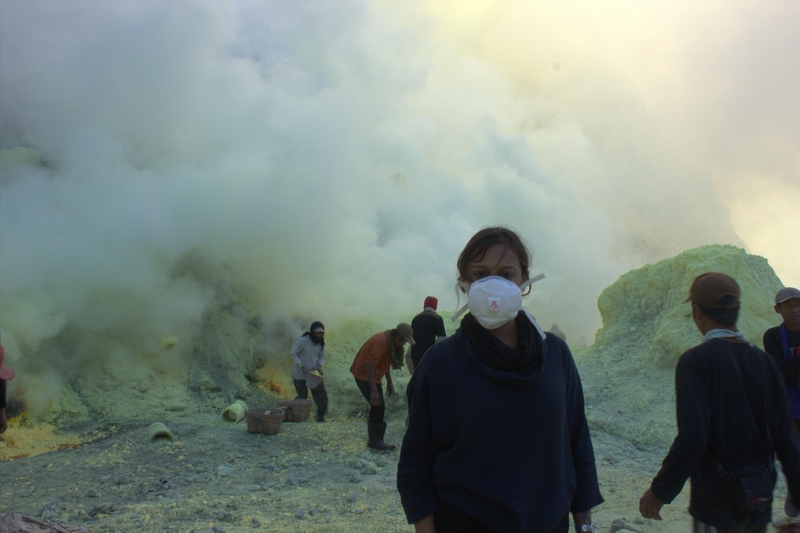 Highly demanded by the fertilizer and oil refining companies, the crude method of mineral extraction at the Ijen crater probably defies all human rights acts, yet the practice still continues. A magnificent turquoise circle cradled by the sheer crater walls, Ijen volcano acid lake is as beautiful as it is treacherous. The breathtaking beauty of its deep aqua blue colour contrasting with the yellow gray barren crater walls entrances its viewers, but the deadly water has PH level which can dissolve metal into nothing in a matter of minutes. 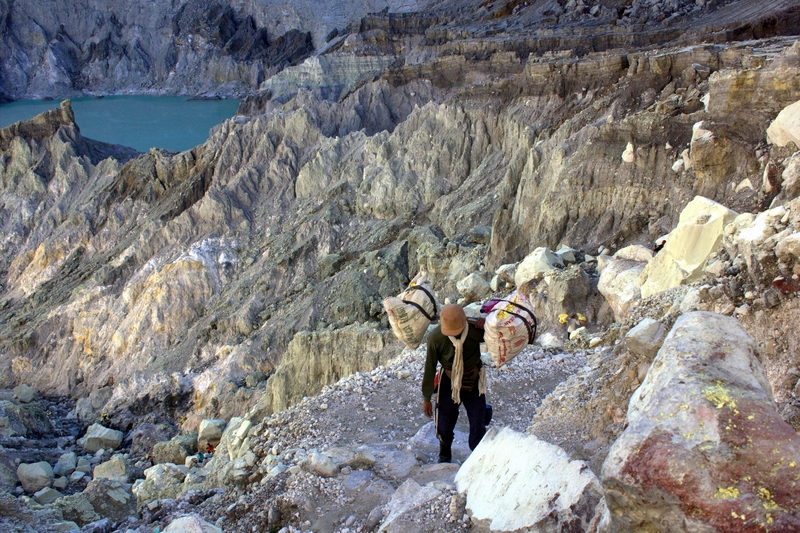 Known as the world’s most acidic lake, Ijen miners defy death, serious health hazards, treacherous terrain and human levels of tolerance every time they go down the crater. 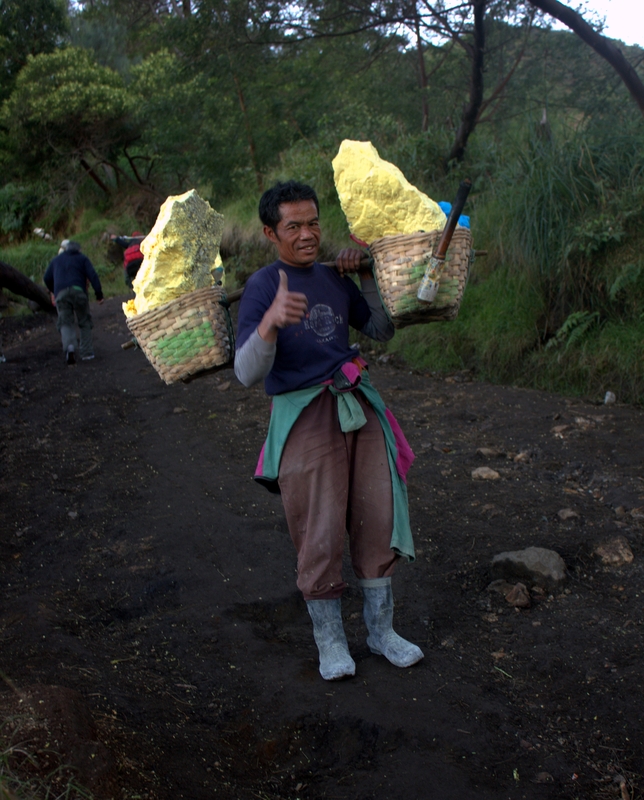 Their days start before dawn and they hike up and down (twice/thrice a day) 2800 meters to the crater lake carrying 90 kilograms of hand collected sulphur on their shoulders. It is one of the world’s most toughest and poorly paid jobs and the lake can instantly kill anyone unlucky/reckless enough to fall in. 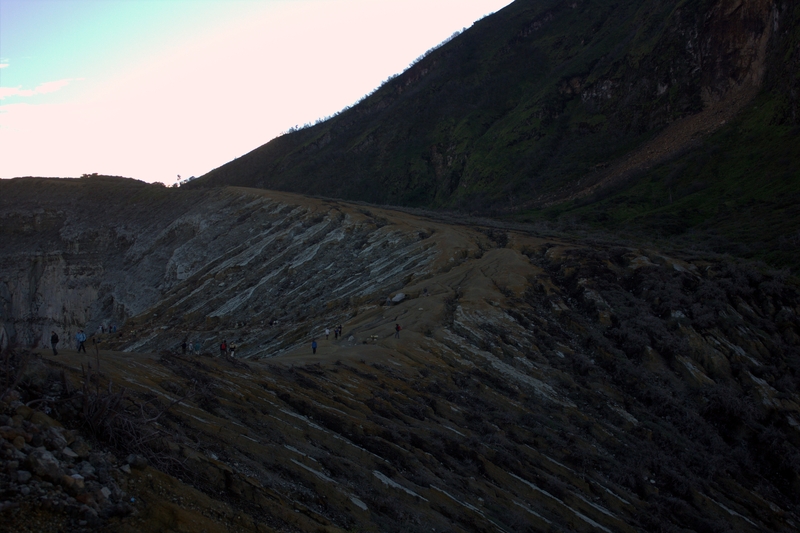 Our Ijen hike too had started early and after registering ourselves at Pos Paltuding we had slowly walked up to Indonesia’s one of most enigmatic volcanoes. It had been a moderately tough hike, with broken trails, dirt tracks and beautiful views. Hardly any facility had been found throughout the trail except for 1 refreshment shop and even the WC signs had pointed out to the wilderness around us. Volcanic cones had towered as we had hiked higher above the fluffy beds of pink clouds and the sun had risen stealthily shading everything in blushing hues. The steep hike and broken path had made us pant and grunt, and at breaks we had sat staring open mouthed at miners who had trudged past us nimbly, bearing heavy loads of pure sulphur on their shoulders. The landscape had become more and more barren, as we had climbed higher and soon the smoking lip of the crater had arrived. The highly active Mount Merapi had stood behind us and we had stared in aghast at its completely burnt out, ash grey slopes. Merapi had exploded recently destroying the vegetation and life along its paths and the chilling reminder of nature’s fury had made that awfully cold morning suddenly seem very warm. 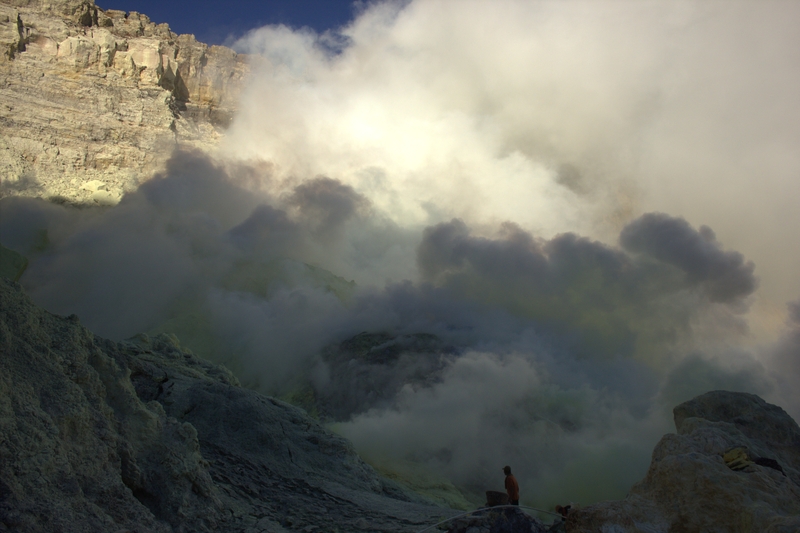 I remember turning my back at Merapi in denial and staring down the crater railings at Ijen’s sulphur pool. The famous blue green billowing lake had tantalized from far down and succumbing to its charms, I had trudged down the 30 minutes walk to its shores. Treading along the narrow treacherous path had not been easy and lack of much advised local guide had made it harder. At places, the path had been too narrow for 2 people to pass through and I had to plaster myself against the crater wall to let the miner trudge ahead. In spite of their hard work, the miners were a friendly bunch and had helped me all the way as I had followed them to the lake. Thick burning smoke and breathlessness had heralded the arrival of the lake and I had watched the calm blue water stare back at me in a deadly deceptive way. Smoke had billowed out like angry furnaces and in spite of my face mask, breathing had been difficult. 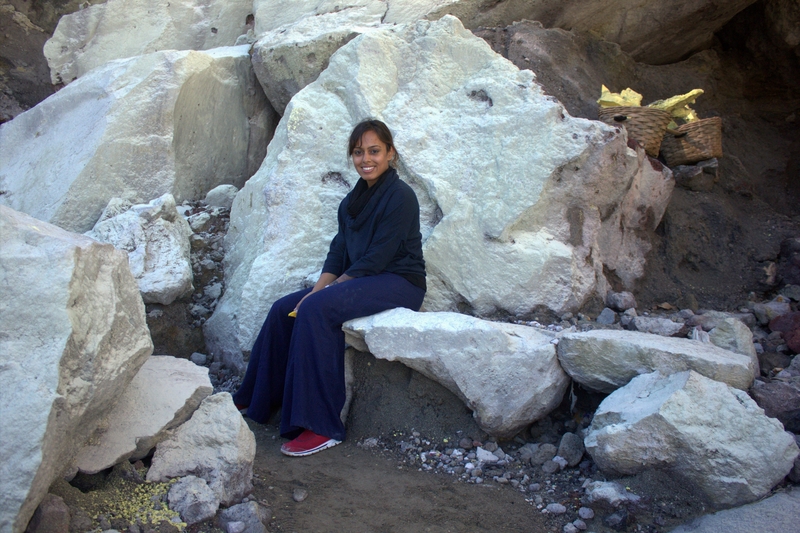 In just a matter of minutes, I had gasped, choked and retched while the miners around me had worked diligently in scooping out fresh sulphur from volcanic gases collected in ceramic pipes. The gases were allowed to escape into strategically placed pipes for condensation, where they turning into liquid before solidifying quickly into hard sulphur. 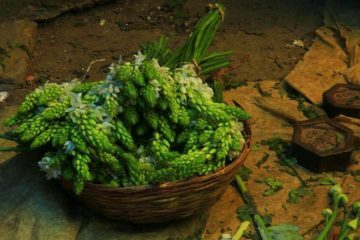 The bright yellow, a bit oily to touch residues were in great demand in cosmetic and pharmaceutical companies and the Ijen miners collected them using most basic of tools. It was this harsh, nearly deadly working condition which had rocketed the Ijen miners into eyes of human rights controversy storms for ages, but strangely it had been the workers who had protested against modernization of their environment. Their dangerous profession brought them a paltry sum of a few hundred Indonesian Rupiah (not even 1 USD) per hike but the fear of losing their precarious livelihood to modernization in a strange wild country, made them climb down into the belly of the deadly beast twice/thrice every day. With only a damp cloth or donated (left over by tourists) sterile face masks covering their nose and mouth for protection against the burning acidic fumes the miners toiled relentlessly through generations in a most death defying manner. It was perhaps this dramatic and sometimes tragic combination of stunning moon like beauty of the region with human pathos and absolute wilderness that made Ijen so lust worthy. Nothing attracts a human attention more than tragedy and/scandal and both usually have lots of beauty involved. 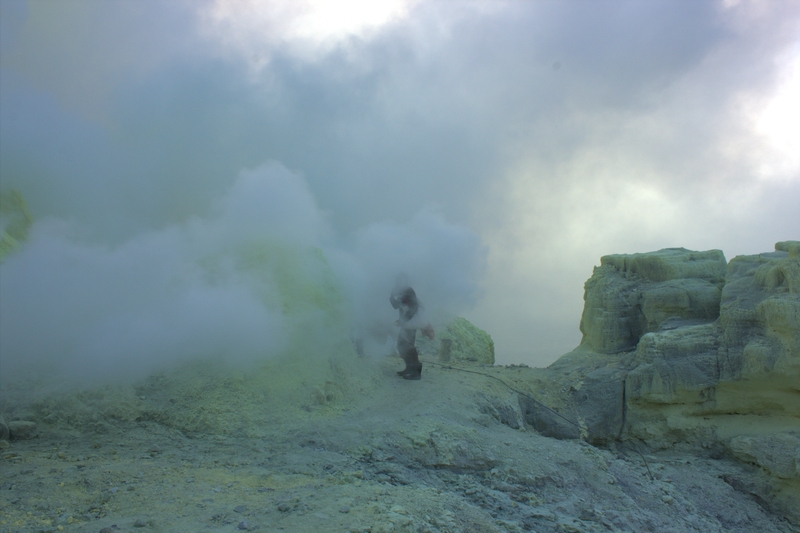 Sure enough Ijen Plateau too had its share of a huge amount of all three and I had left it shaken to the core and completely mesmerized. The constantly swirling deadly sulphuric clouds had made breathing too laborious and I had been forced to leave in just a matter of minutes. Fresh air had hit my face at the mouth of the crater and nothing had felt sweeter than that seemingly new lease of life. I had sucked in lungfuls of the clean, cold morning breeze and sat down at the lip to calm my trembling heart. It had been a sheer trip to hell, one which had shaken me very badly but its hypnotic beauty had somehow put a spell on me. 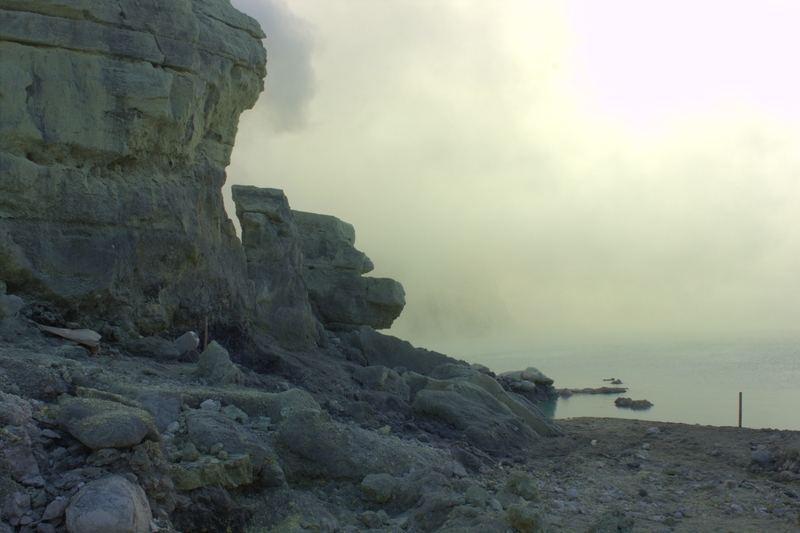 I remember contemplating on staying longer in Ijen to experience the fabled “Blue Fire” but its scary filming conditions had made me change my mind. 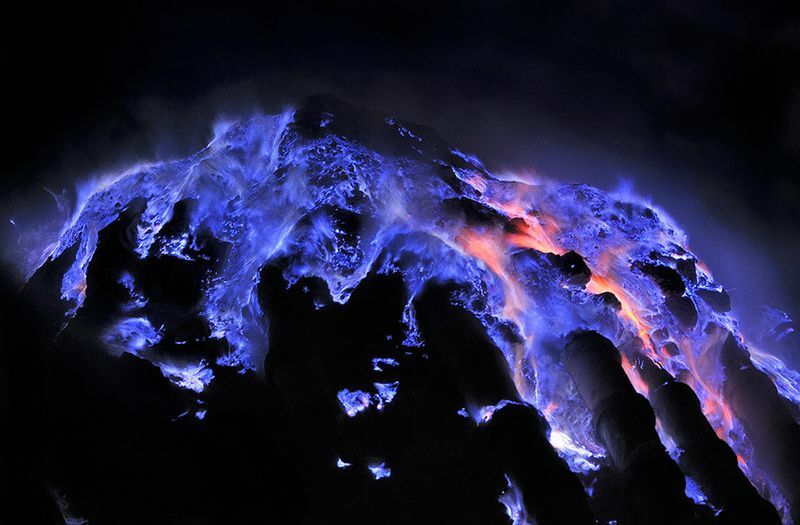 First captured by the Paris based photographer, Olivier Grunewald, Kawah Ijen is famous for the electric blue fire streaming down its slopes at night. 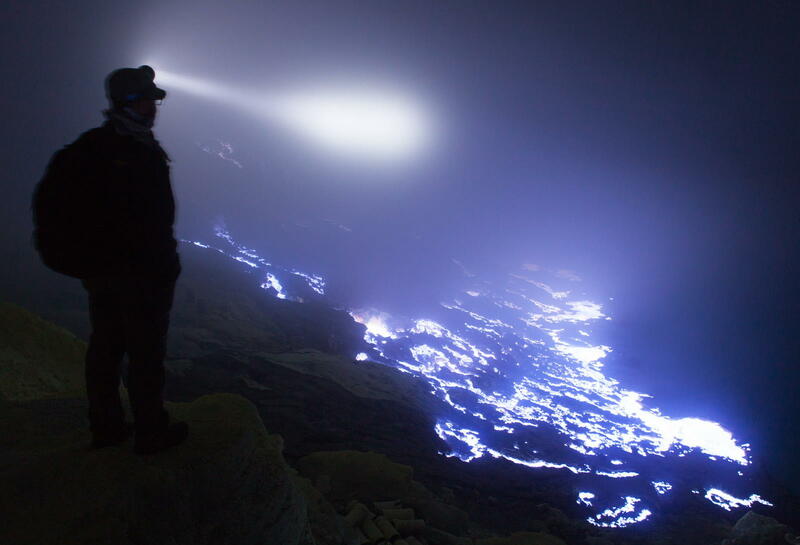 Often misinterpreted as lava, the combustion of sulphur, upon contact with air creates the blue lava like rivers of light inside the Ijen crater and miners often work under the eerie blue light at night to escape the day’s heat. Although, active throughout the day, the darkness makes the blue light visible. Grunewald had lost quite a few cameras and lenses while attempting to film the “Blue Fire” inside Ijen and had barely managed to stay there for more than a few minutes. 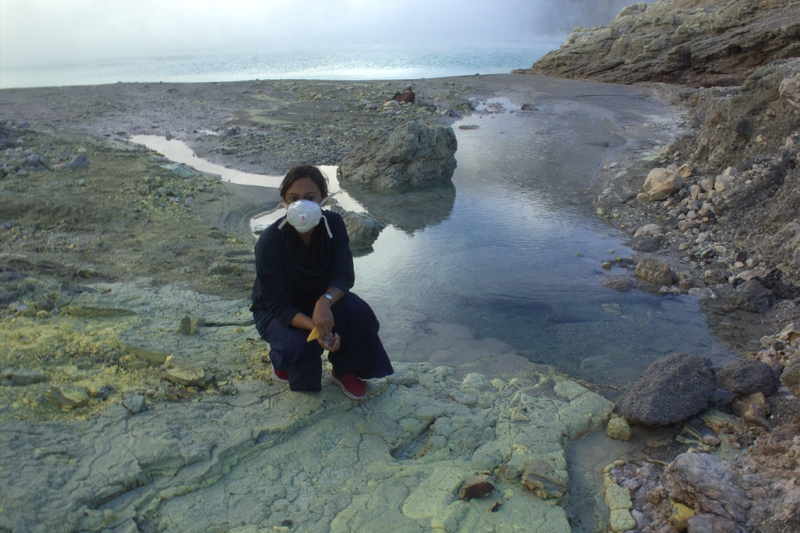 His scary experience with the scarier thought of going down to the acid lake alone at night had made me not pursue the reckless wish and I had left Ijen with a heavy heart. I don’t know whether it was the lake’s hypnotic beauty or the life of the miners which had made me so despondent, but I had stood by the crater for a long time, taking in the surreal scene before leaving for good. I had been sure that I would never return to Ijen again, but the experience had been one which was going to last me a lifetime and I greedily wanted as much of it as possible. 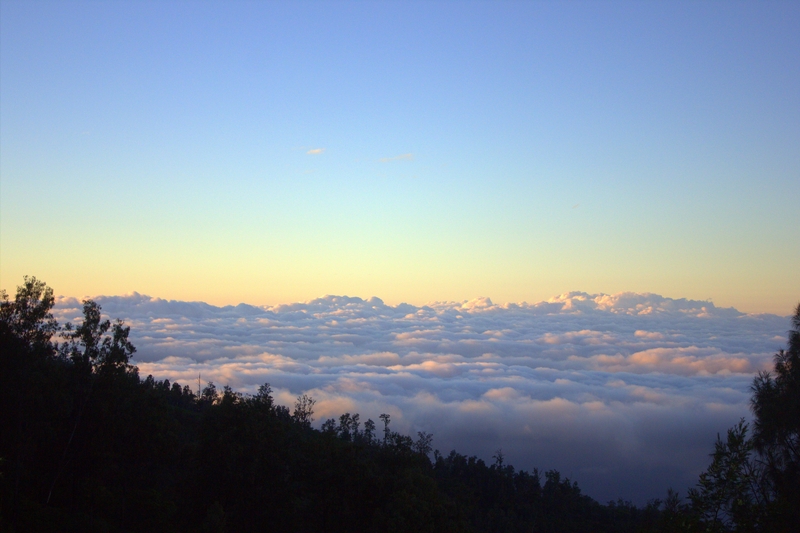 TRAVEL TIP – Accessible from both Bondowoso and Banyuwangi, the trail head to Ijen starts at Pos Paltuding. 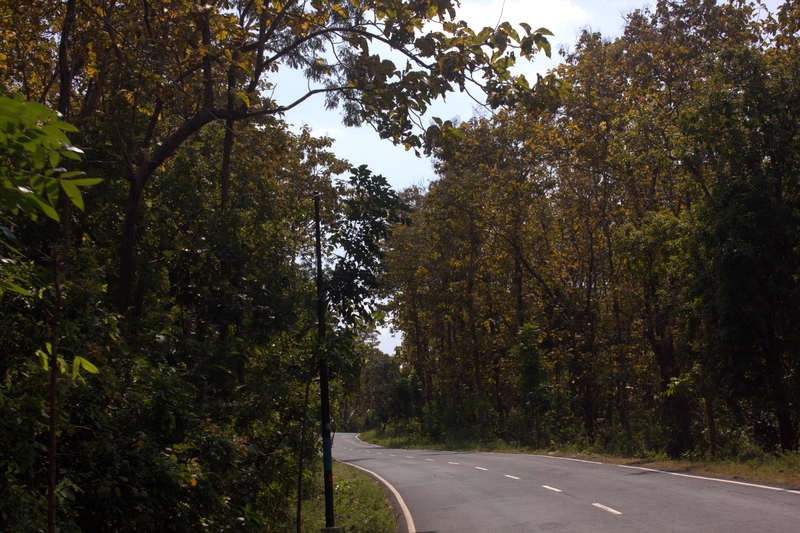 Banyuwangi is closer but expect bad roads and poor transportation. 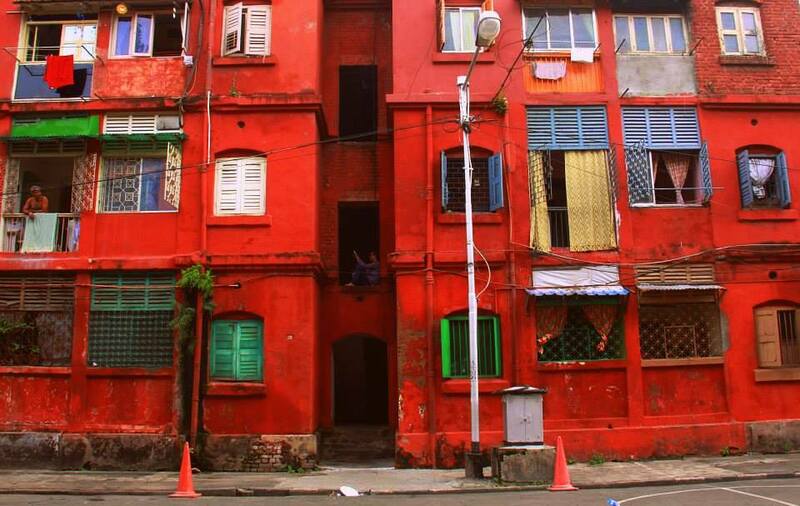 Pos Paltuding is 64 kilometres from Bondowoso, but public transport won’t bring you that far. From the bus terminal in Bondowoso you can get a minibus via Sempol to Blawan/Kaligedang. The bus leaves aroun 11.00 o’clock in the morning and it takes about 3 to 4 hours. It takes that long because it is a very bad road, compared to some years ago. At the terminal you can ask for the price, it should be around Rp. 15,000 per person. If the time or the mode of transport doesn’t suite you, you should be able to find a charter by car or motorbike to anywhere in the plantation. A car will cost you around Rp 400,000 till Rp 600,000. By motorbike it will be approximately Rp 150,000 – Rp 200,000. 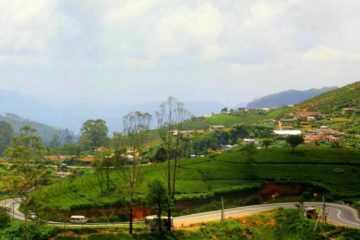 From anywhere in the coffee plantation you should be able to find someone who will take you the approximately 15 kilometres to Pos Paltuding, either by car of at the back of a motorbike. At Pos Paltuding there are usually a few motorbikes to take you back or on to Banyuwangi. The minibus back from Blawan/Kaligadang to Bondowoso leaves around 06.00 in the morning. 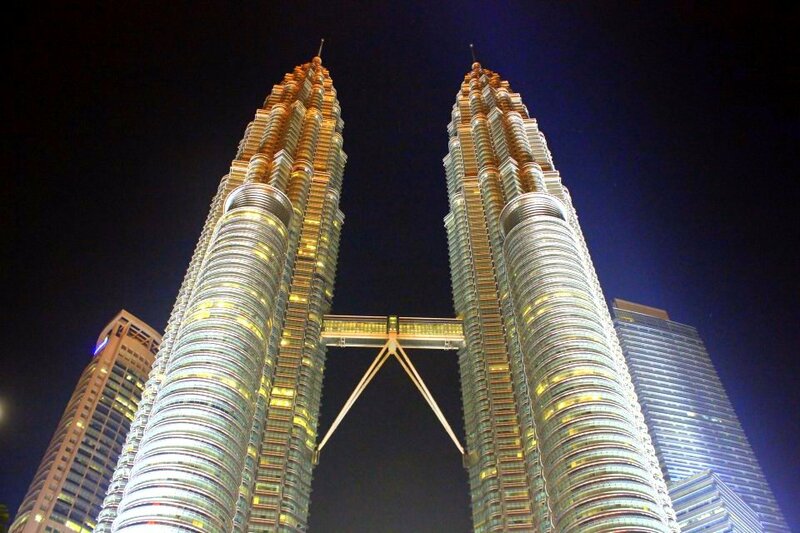 Accommodation options are not great and there are a few home stays available also. 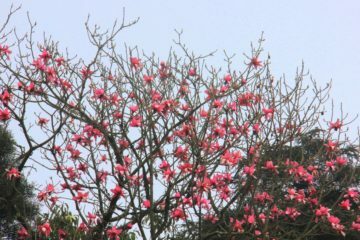 For a detailed Ijen accommodation list check out (http://www.ijenplateau.com/accommodation). 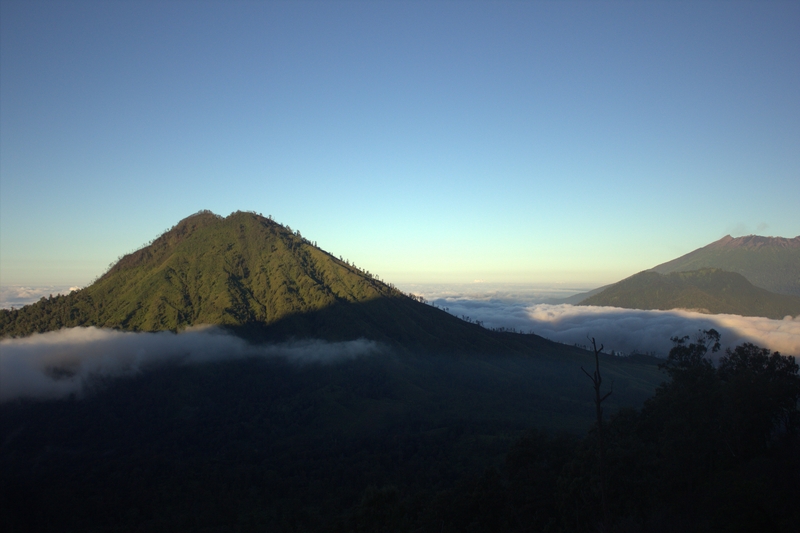 Out of all the available choices, Arabica Homestay is most favourably spoken of in the Ijen travelers circuit. 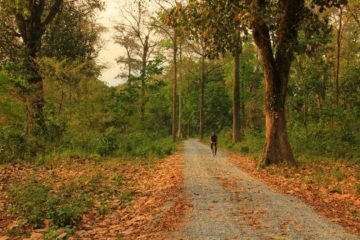 While most leave for Gilimanuk, Bali from Ketapang, after completing the Ijen trip, the ancient rainforests of the remote Alas Purwo National Park make an equally delightful break. 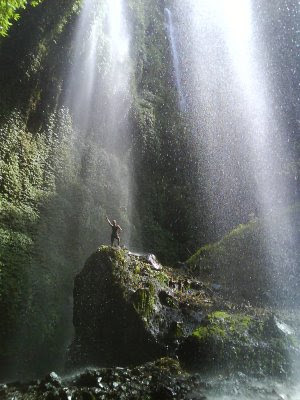 For more details check out (http://www.indonesia.travel/en/destination/519/alas-purwo-national-park-ancient-rainforests-on-java-s-most-eastern-peninsula) The easier to reach and closer to Bali, coastal forests of Baluran National Park also makes a lovely post Ijen getaway. 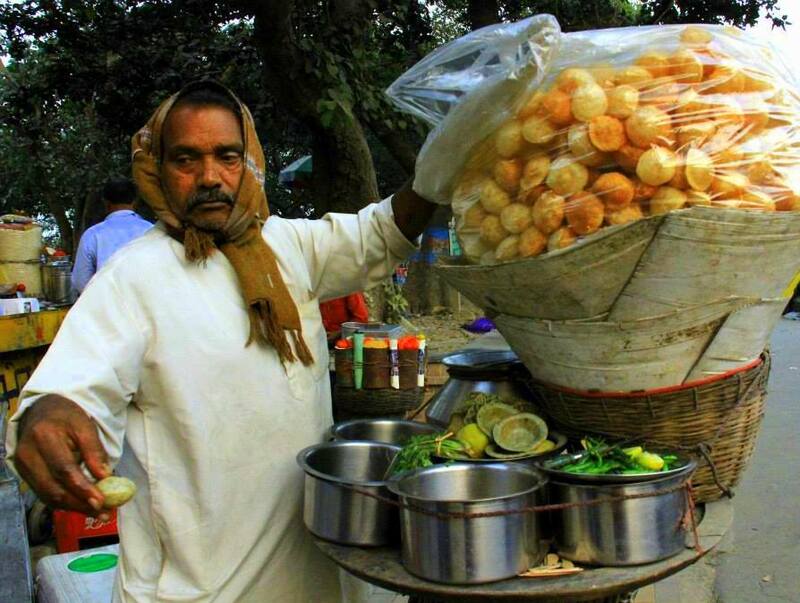 Some photos have been taken from the internet. Thank you. I was too. Superb. Thanks for sharing. Keep it up!! It was an amazing experience. Thank you very much Lena. Thank you Kamila. It was like another planet. Wonderfully written. 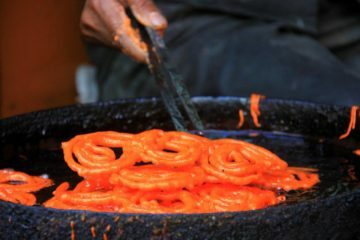 Travelogue is something which I always love writing. 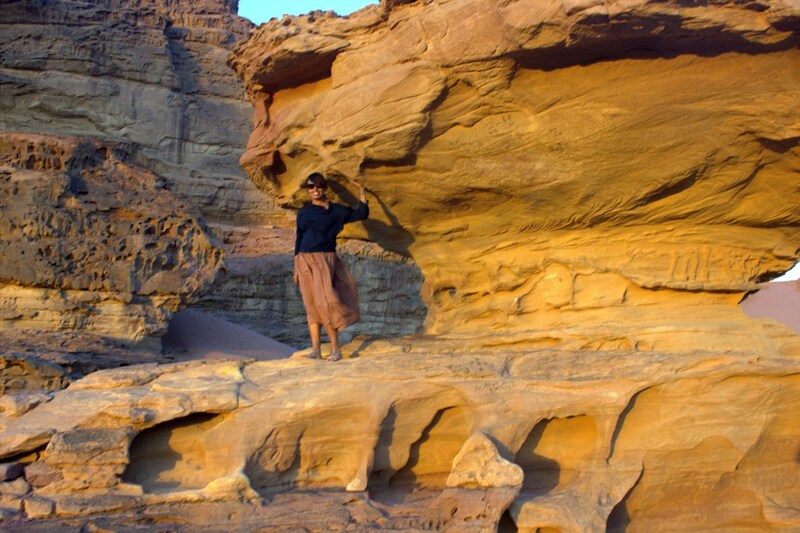 Please do check these travelogues as well. Thank you. It will be my pleasure to go through your travelogues.